Lunges are an exercise that you should have in your routine. They give a great all-over lower body workout. They can be a bit challenging to do when you are starting out. But the rewards are worth it. They improve muscle strength and tone of the legs and buttocks. And they help improve your balance and core strength. Make sure you keep your head up and shoulders back. Balance is important in this exercise. Take a large stride forward. The front leg should bend 90 degrees at the knee. Now bring your left leg forward and return to the starting position. Now alternate the legs. Step forward with the left leg. The left knee with be at 90 degrees. The right knee will be near the floor. 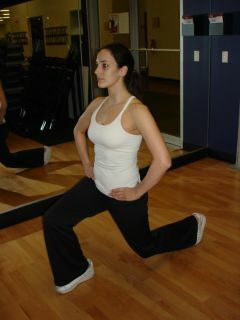 With properly done lunges the front knee should be bent no more than 90 degrees. Don't go beyond this point or you will be putting too much strain on the knee. The knee of the rear leg can almost touch the ground. This may take some practice but with time you will be able to do it. Stepping in place or stepping forward? You can do lunges two ways. 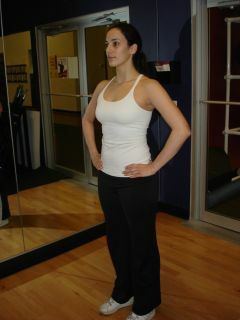 You can bring your back leg forward after each lunge and you will move forward as you exercise. It's like taking large forward steps. Or you can lunge forward and then step back to return to the starting position. You lunge forward, return, forward, return. You are lunging in place. Try both ways. They work the muscles in different ways. When you are just starting out you might need some time to build up your strength and coordination. In that case just make your steps smaller and don't bring your knee so close to the floor. When you need more of a challenge you can use weights with this exercise. Just take a dumbbell in each hand while you exercise.